Congratulations on your decision to enroll your child in Tang Soo Do! This art is designed to develop individual character, mental strength, integrity, discipline, and respect. In Tang Soo Do, a child learns respect for authority figures, including parents, as well as respect for him/herself and others. Tang Soo Do encourages courtesy, patience, loyalty, honesty, and self-control... values that are not specifically taught in most Western sports. Values learned in the studio give the student concrete, practical guidelines for behavior in his life. Martial arts training also helps alleviate the fear most children have about handling themselves if someone physically confronts them. Tang Soo Do is a traditional martial art that traces its roots back to ancient Korea. For more than 2000 years, the art has been passed down from instructor to student. Throughout its rich history, Tang Soo Do has been refined and polished. Today, the World Tang Soo Do Association continues to ensure that our art remains the best in the world. 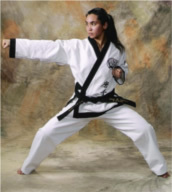 A studio certified by our Association and headed by a trained, certified Black Belt instructor is a guarantee of the best martial arts instruction available today. Our founder, Grandmaster Jae Chul Shin, first brought Tang Soo Do to the United States in 1968 and quickly saw it sweep across the country. Within a few short years, requests for Tang Soo Do training began pouring in from countries all over the world, so in 1982, he founded the World Tang Soo Do Association. Now, Tang Soo Do is taught in more than 30 countries in 6 continents and has hundreds of thousands of students worldwide. Your child’s instructor will be giving you various registration forms when your child first enrolls in the studio, one of which will be the application to join the prestigious World Tang Soo Do Association. Please fill out these forms completely, making sure they are signed by both you and your child, and return them promptly to the instructor. After your child has submitted his or her World Tang Soo Do application form for processing, headquarters will send him or her a student manual and a registration/identification card requiring his picture. These will be used many times during his or her training. Make sure these two items are kept in a safe and accessible place. Again, congratulations on making this opportunity available to your child and a warm welcome to both of you! QUESTION: Who will be instructing the class? ANSWER: In order to teach in the World Tang Soo Do Association, all instructors are required to pass an Instructor’s Certification program. Furthermore, our Black Belt instructors participate in regularly scheduled instructor classes, training camps, and seminars. All of our instructors have also undergone background checks with the Pennsylvania State Police. You may also see several assistant instructors who work with students in small groups or even individually. When you watch a Tang Soo Do class, you see students enjoying themselves in a friendly environment led by caring, knowledgeable teachers. QUESTION: Will classes leave my child battered? Will my child become a bully? ANSWER: While classes are designed to be fun and exciting, we also teach that what we are learning should never be taken lightly. Safety gear and special equipment are required, and respect for others and self-control are two rules we strongly emphasize. The codes and tenets, which serve as our foundation, reinforce tolerance and compassion for others. QUESTION: What will my child get out of class? ANSWER: We help students reach their fullest potential by teaching challenging classes, setting goals for our students, and giving them the necessary skills to reach those goals. In addition to improving physical conditioning, flexibility, and balance, students learn skills necessary for self-defense. Along the way, students develop integrity, self-esteem, and confidence. We guarantee that dedicated training will result in better focus and concentration. For all these reasons, it is typical that students enrolled in Tang Soo Do also report improved grades in school. QUESTION: Should I join Tang Soo Do with my child? ANSWER: Absolutely!!! Every student trains at his or her own pace, so anyone, regardless of age or present condition, can study Tang Soo Do. Karate is done from a standing position, and kicks and punches are learned without body contact. In this way, coordination and flexibility can be increased at any age. Also, when children see important values illustrated by their own parents, they have strong role models to follow. Fun, wholesome activity, like Tang Soo Do, that actively involves the whole family strengthens family ties. It’s true: Families that kick together, stick together! QUESTION: How do parents stay informed? ANSWER: There are several ways for parents to keep up with Dojang information. One is to check the Vaughn’s Dojang website at www.vaughnsdojang.com. Another is to listen to announcements made by instructors at the end of class. Also, there is a bulletin board at the back of the studio with a calendar of events and information about what’s happening at Vaughn’s Dojang. Your child will bring home flyers and announcements from time to time. Ask to see them. Finally, if you ever have questions, don’t hesitate to speak with your child’s instructor. QUESTION: How often will my child attend class? ANSWER: Classes are scheduled for one hour sessions, two days per week. Later, as students grow in rank and commitment, more classes become available. Please read the section under Class Protocol regarding missing classes. QUESTION: Are classes ever cancelled? ANSWER: There are a few days during the year when the studio is closed for holidays or a special event. In case of severe weather, you may want to call the studio before leaving home. There will be an announcement on the answering machine and on our website if the studio is closed because of weather problems. QUESTION: What is the Black Belt Club? 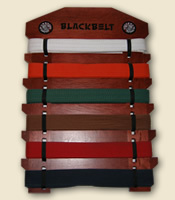 ANSWER: When a student reaches the Green Belt level, he or she may decide to join the Black Belt Club. This club is dedicated to students who take a serious approach to their training, and who are committed to completing their journey to Black Belt Excellence! Black Belt Club members enjoy financial and other benefits, such as additional training opportunities. Click here for more information on the Black Belt Club. The instructor will advise the student when testing for the next belt will occur. It will be the sole discretion of the instructor to determine if advancing to a new level is in the best interest of the student at that time. When the minimum time has passed, your child’s instructor will evaluate several factors, including but not limited to: progress made in training since the last test, attitude, general knowledge, conduct in class, etc. The road to Black Belt is a long-term commitment which cannot and should not be hurried any more than growing up should be rushed. At every stage in Tang Soo Do, there are valuable lessons, physical and mental, to be learned, and some take longer than others. Not all students in a class will advance at the same rate. When an instructor has determined that a student is ready to move to the next phase of training, the student will be required to pass both a physical test and a written test based on information found in the student handbook. Prior to the written test, the student must complete and return to the instructor: 1) a testing application form, 2) the testing fee, and 3) the student’s registration card, which must have a photo attached. Student evaluation is actually an ongoing process that takes place during a student’s training sessions. The final step in the process is a demonstration of skills before a testing panel and a promotion ceremony when new belts are awarded. This event is a celebration in which all students should participate, not just those receiving their new belt. A student’s attendance at these ceremonies shows support of fellow classmates as well as dedication to one’s personal training, and is counted toward the number of classes needed for his or her next promotion. Belt promotions are held at the conclusion of the Gup Test at the main studio in Audubon on a bi-monthly basis. Watch for announcements on the Home page and the What's Happening page of our website or check with your instructor. Most all of the information pertaining to training protocol is explained in the WTSDA student manual and should be reviewed on a frequent basis. There are a few important issues explained there that should be mentioned here for emphasis, however. Students should arrive at least 15 minutes before class is scheduled to begin. Upon entering (and leaving) the Dojang (studio), students should bow to the instructor and salute the flags. Once inside the Dojang, the student should quietly begin warming up and stretching off to the side. For safety reasons, no gum is allowed and all jewelry and watches should be removed. If a student arrives late, he or she should prepare him/herself for class and then wait to the side until he or she is recognized by the instructor and asked to join the class. If a student must miss a class, he or she should notify his or her instructor beforehand. In other words, at the beginning of each class, an instructor should know where every student is. If a student must leave class, he or she should first receive permission from the instructor. One of the most misunderstood aspects of training in a traditional martial art is the meaning of the bow or Kyung Yet. In Tang Soo Do, the bow is a form of greeting and sign of respect. (This is the same reason why all Black Belts are to be called "Sir" or "Ma’am" by Gup students.) 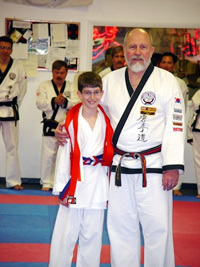 A student is expected to bow to his or her instructors, all Black Belts and Masters, whether in the studio or out, and also to his or her opponents. The bow is never interpreted as the student being less or lower than the senior rank, but it is an expression of his or her humility, courtesy, pride, and self-esteem. Black Belts and senior ranks are also expected to return the bow. A person who can show humility is a truly capable leader. The Do Bohk or uniform can be traced back to 600 AD in Korea, and therefore is a symbol of special accomplishment. This traditional symbol should be worn and maintained with great care and respect. Do Bohks should be cleaned and pressed for training. A student should not expect to train if not in full uniform. Once a student achieves Green Belt, the lapels of the Do Bohk top must be trimmed in the same color as the belt (except for Cho Dan Bo). Trim kits are available through the studio. There is only one acceptable way to tie the belt and to fold the uniform when not being worn. Please refer to this section of the student manual for details and instruction. Even young students should be taught to tie their own belts correctly. The only markings on the Do Bohk are the Association patch on the left, front (over the heart), the Korean flag on the left shoulder, the student’s national flag displayed on the right shoulder, and the identifying studio insignia on the back. There should not be colored shirts visible under the Do Bohk, and the Do Bohk should only be worn for training or competition. Do Bohks can be ordered from the studio. Instructors can help with sizing. Safety equipment is important to prevent injuries while training and is a requirement for all competitive sparring. By the time a student achieves his or her Orange Belt (earlier is okay), he or she must own a complete set of sparring equipment. The set should include protective headgear, hand gear, footgear, and a mouth guard. Boys are required to wear a protective cup in competition. Safety gear can be ordered from the studio. See an instructor for order forms and for help determining the correct size gear to purchase. When a student becomes a Green Belt, he or she will begin training with a Bong or rounded staff, which should be brought to every class. This weapon developed from everyday living tools such as early farming or hunting implements. The length of the bong should measure the height of the student (plus or minus no more than 2 inches). It should be no larger in diameter than can be comfortably held and maneuvered in the student’s hand (1/2 - 3/4 inches). Bongs can be purchased from the studio, but for the younger student, any hardwood stick like a broom handle or a wooden extension pole found in a home supply store can be used if it is the right length and diameter. The more a student practices Bong drills on his or her own, the more proficient he or she will become with this first weapon. 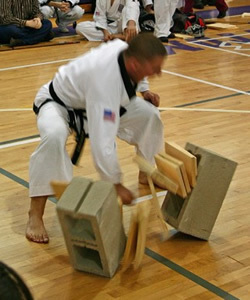 When a student tests for his or her Green Belt (and for all tests after that), he or she will be asked to break boards as part of his physical test. Breaking is a test of concentration and proper technique. It is important to bring the correct type and size board to the tests. At Vaughn’s Dojang, we provide boards for purchase. The drier the wood, the easier it is to break, so a good board should be light weight and sound hollow when tapped. Sap in the wood acts like glue and makes the board dense and harder to break. The boards available from the studio are cut from white pine that has been kiln-dried. The boards should be 1 inch thick and 12 inches wide, and the height depends on the age or size of the student. Boards should be cut (across the grain) in 8-inch heights for small children, 10 inches for teens and adults. Gray lines indicate grain direction. 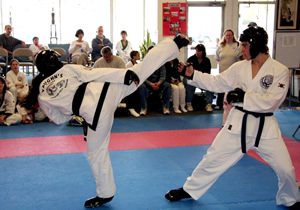 The techniques and forms found in Tang Soo Do are designed to improve the student’s ability to defend him/herself. The more a student practices outside of class, the sooner his or her techniques improve and the better able he or she is to defend him/herself should the need arise. Practice also magnifies the other benefits of training such as improved fitness, flexibility, concentration, and discipline. For these reasons, natural athletic ability is not a substitute for diligent practice, especially as a student progresses into higher ranks. Ultimately, a student’s training is his or her own responsibility and his or her dedication will determine the speed and level of his progress. Like any other worthwhile endeavor, the more a student puts into his or her Tang Soo Do training, the more he or she will get out of it. While Tang Soo Do is considered an art as opposed to a sport, there are a number of regional tournaments scheduled that provide competition for those who desire to compete. The ultimate in Tang Soo Do competition is the World Tournament held every other year. Some of the benefits of competition include meeting students from other schools and even other countries, increased confidence, the chance to compare techniques with other students, and the opportunity to learn from others. Tournaments are always educational and fun to watch, even for those not competing. 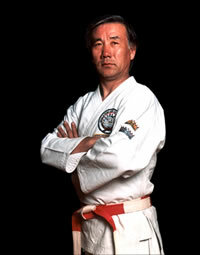 Tournaments are arranged so that students of similar age and belt level compete with each other. Events include Hyungs (Forms), Dae Ryun (Sparring), Weapons, and sometimes Breaking. 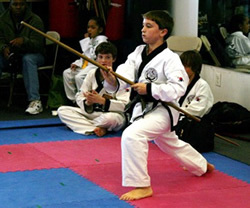 Students may compete in some or all events depending on their belt level. Your child’s instructor will prepare the students for upcoming competitive events. Parents and family members are strongly encouraged to attend promotions, tournaments, and other special Tang Soo Do events. These special events make wonderful opportunities to photograph or videotape your son or daughter "in action". 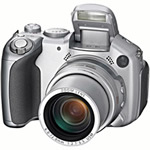 We ask, however, that you do not bring cameras to the studio to photograph or tape any students while they are training in regular classes. Thank you for your cooperation in this matter. One of the great joys of being a member of the World Tang Soo Do Association is the opportunity to train with students almost anywhere in the world. If you are traveling and there is a World Tang Soo Do studio near where you will be, you may want to consider stopping in for a visit or training session if scheduling permits. Proper protocol must be observed in order to do this. You should first ask your instructor for permission to train at another studio. Then you must contact the studio owner where you will be visiting beforehand to ask permission to stop by. Headquarters in Philadelphia or the Internet can provide you with a list of certified studios all over the world. Frequently, a visit to a new Dojang can be the highlight of a trip for a student. If we are experiencing severe weather conditions, you can check on class cancellations either by calling the main dojang at 610-676-0691, or by checking our website. Welcome to the wonderful world of martial arts. It is important there be an understanding about what to expect when taking on an endeavor such as traditional Tang Soo Do. First 6 months: In the beginning, if you are like most people, you will experience a sharp learning curve, where you will see results quickly. Focus and concentration will increase at a rapid rate. Balance and coordination will improve dramatically. There will be an increase in flexibility and muscle tone. Second 6 months: The student should go over basic stances and basic techniques every day. It seems to take longer and longer to achieve results. This is normal, and this is where self-discipline comes into play. As well as having peaks, where technique is picked up quickly and understanding is high, there are times when it seems that not much is happening but work. These times are what I like to refer to as plateaus of learning. It is this time, when it seems like class is just drill, drill, and more drill, that the serious student is born. Understanding this type of learning curve is important to understanding martial arts. The skills that are acquired through traditional martial arts study sometimes develop at a slower pace than the novice student would like. If students persevere through these plateaus of learning, however, new and exciting power is their reward. Our instructors are experienced motivators. If your child seems to lose interest, let his or her instructor know. They will work with your child to get them back on track. Unlike anything else, Tang Soo Do is a method of self-actualization where a student can define one’s self, and study human nature as well. Tang Soo Do is not a store-bought item. It must be experienced to appreciate its value, and this takes time, perseverance, and patience. The original name for Tang Soo Do was translated as: Hard Work, or Grinding Out and Polishing. This applies to the physical being, the mental being, and the spirit of the student. I like to compare the trip to Black Belt to a college degree. If the student looks at it this way it saves confusion later on when the training becomes more like work. By sticking it out and making an all out effort, the average student can make it.